In 1875, Ahkah, a 9-year-old Comanche girl, is the only child in a group of 72 Plains Indians brought to the Castillo de San Marcos in St. Augustine for "re-education." Callie Crump, a 14-year-old who has never so much as seen an Indian, begins to teach art classes to the prisoners. At first she is reluctant, but it doesn't take long before she finds herself fascinated by the lives of the Native Americans at the fort. All the while, Akhah longs to return home, but finds comfort in learning an old skill, making bows and arrows to sell to tourists. 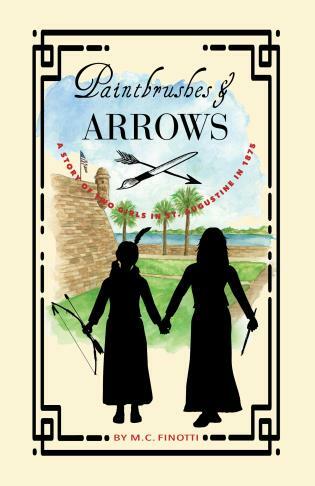 Paintbrushes and Arrows follows the lives of these two girls and their crafts, which bring them closer together than either could ever have guessed. M.C. Finotti is a journalist and former teacher who grew up imagining what it would be like to live in the “olden days.” Ms. Finotti lives in Atlantic Beach, Florida, with her husband and two children. She is the author of The Treasure of Amelia Island, winner of the Florida Historical Society's Horgan Award for children's historical fiction.